Here's where it all began. 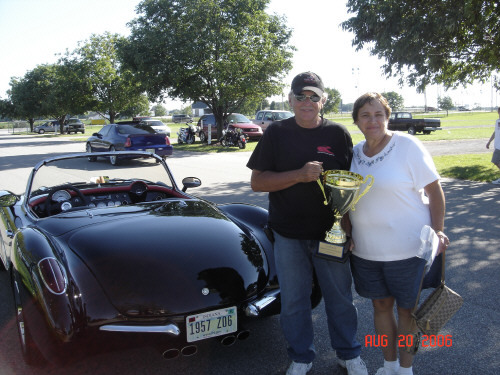 I purchased this 1957 Corvette along with a 1967 427/435 Hp Corvette roadster in the early 70s as a package for $2500.00 from Don Ramone a notorious street racer from Calumet City, Illinois just south of Chicago. 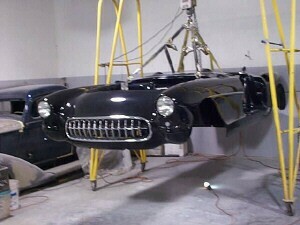 The 435 was smacked in front and the '57 was a presentable car. I repaired the big block and drove it regularly. It was ill tempered, ferocious, loud, and temperamental. It ran cheater slicks throughout its life. I beat on it but it never learned to behave. I put it away in favor of driving the 1957 because of my job as a school teacher. I felt that I should begin showing some maturity and start blending in a little more with society. The big block sat in the garage for 20+ years and I finally sold it a few years back. The guy who bought it wasn't as much interested in the car as he was with its tank sticker. 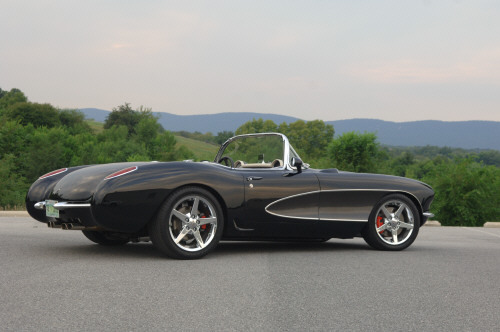 It documented the car as a 427/435 Roadster with J56 brakes and other rare options. The car was rough so basically he paid dearly for a tank sticker. 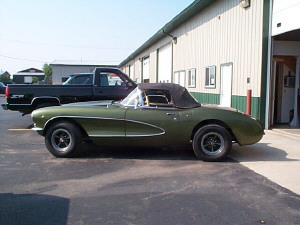 The picture of the 1957 Corvette shown in green shows what the car looked like before its metamorphosis into its current state. 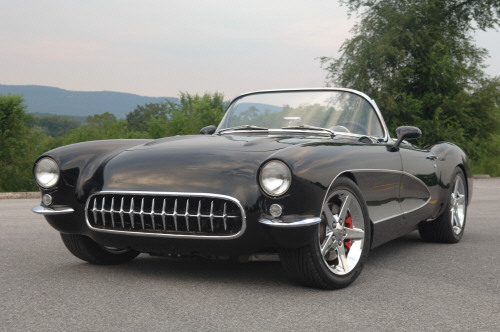 At that time it was powered by a 350 Hp 327 backed by a 4 speed transmission. I didn't think the car was a candidate for restoration because by the time I got done with it none of the numbers matched and it was "rode hard and put away wet." The pictures show some stages of the rebuilding process. 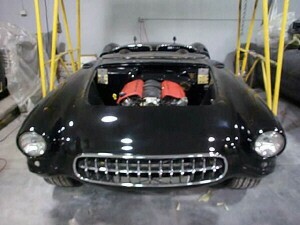 The pictures of the frame and running gear show the C5 -C6 Corvette architecture. The 6 speed transmission is in the rear. 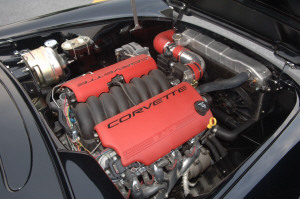 The engine is a 405+ horsepower Z06. This running gear is supported by a round tube frame from SRIII Motorsports. 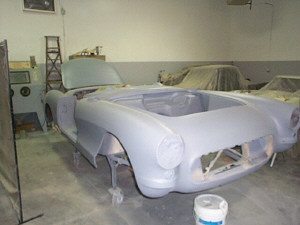 The body has been widened 4 inches and features carbon fiber coves, dash, and trim. 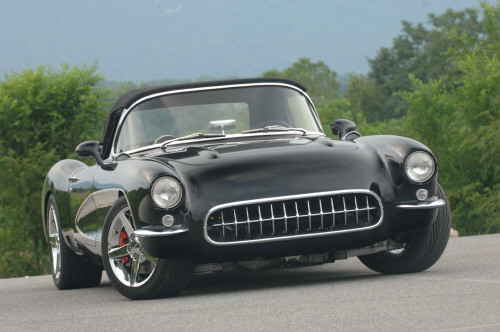 The car has been featured in the February 2006 issue of "Corvette Fever" and is featured in Jerry Heasley's book- Corvette Masterpieces. 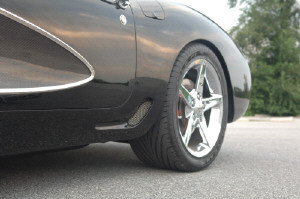 The car is docile and well mannered but will blow the doors off new Z06s and Vipers.